Welcome to another Caturday where we feature cats and absolutely nothing else. The first cat of the week is Camouflage Cat. Well, some of this story is true, because this is indisputably a picture of a cat on a floor. Given that it’s source is the Daily Wail, it may be more embroidered than is claimed. 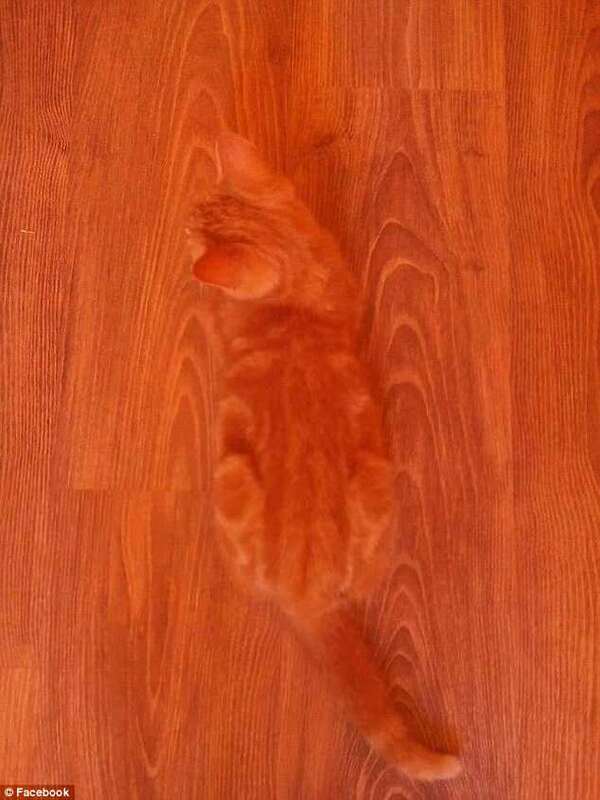 Nevertheless, this ginger tom perfectly matches the stain on its staff’s floor boards. Next we have a cat and a humming-bird. One of the two is a perfect troll. That cat behaves itself perfectly. Finally, a strange story of AI and cats, namely the Meow Generator where a computer is trained to learn what a cat face is from a database, and then generates its own. It’s the brainchild of Alexia Jolicoeur-Martineau. The results are a little disconcerting if indisputably cat-like. What do you think? If you need something to soothe your senses after those cats, you could try Neko Atsume, which is a zen garden of cats on your phone. It’s free and available for iPhone and Android. This entry was written by whyevolutionistrue and posted on July 7, 2018 at 2:00 pm and filed under Caturday felids. Bookmark the permalink. Follow any comments here with the RSS feed for this post. Both comments and trackbacks are currently closed. Neko Atsume: Kitty Collector- only for Androids. Sad! Meow Generator reminds me of The Island of Doctor Moreau. Neko Atsume has been available for iOS for years. Thanks! It would not show for me! I think I’ve solved the conundrum of why medieval artists couldn’t paint catlike cats and the cats they do paint look like humans. That’s not the case at all, i.e., that they couldn’t. There are cats that do look like humans. https://twitter.com/AMAZlNGNATURE/status/1014971440741769216. There just must have been a lot more of them around way back then than now. That last statement was made in jest; and finding one cat that happens to have a human-like visage doesn’t prove anything; but I do find it astounding that here’s this one, and it does look remarkably like some of the “bad” illustrations of human-faced cats in medieval manuscripts and later. BYW, Frida Kahlo’s black cat is a perfect rendering; that annoyed/alert cocked ear and the look in its eyes say it all. That cat could just walk right off her shoulder and into the world. That cat is extraordinary. It’s disconcerting. It feels wrong. (This is subconscious human bias, I’m sure): It also looks incredibly intelligent. As if it’s about to say something. And – it knows things. Look at its eyes. Unfortunately, with a black cat, they’d be after her, too. And unfortunately, that reminds me of the great cat massacre, which I do not want to think about. Not long ago we had a discussion about it and one of the hypothtses was that cats simply looked more human then. I think Heather showed us one eample, but this one is eerily human looking. On several occasions, I’ve seen hummingbirds check out my cats in similar fashion to the video. Even once they checked me out that way. I don’t think they are teasing, I think it is just their way of getting a better look at something. Yes, it does not look the hummingbird is really ‘mobbing’, like songbirds are wont to do with owls. The generated cats look very real to me.